The Ecosystem Component of the CarboEurope-IP will provide the carbon fluxes in and the carbon balance of major European landscape elements, reflecting their diversity, the inter-annual variability driven by climate and other factors, the flows of carbon between different ecosystem pools (biomass and soils), their exchanges with the atmosphere, and the magnitude of ecosystem pools themselves, and the controlling biogeochemical processes as a basis for bottom-up assessments of the European carbon balance. 1.1 To observe the fluxes of carbon, water and energy from representative land use/cover types of Europe by eddy covariance. 1.2 To partition the net carbon flux in European ecosystems into its constituent parts (C pool changes) according to land use types and management, using a spectrum of time scales going from sub-daily to decadal, e.g. by comparing carbon fluxes with stock changes in ecosystem pools. 1.3 To quantify the effects of land management on the net ecosystem carbon and CH4 and N2O exchange. 1.4 To provide the basic data for evaluation and parameterisation of models for up-scaling of carbon fluxes to the regional and continental scale. The overall ecosystem net carbon flux, its inter-annual and seasonal patterns and its partition into photosynthesis and ecosystem respiratory fluxes. The growth and turnover of biomass (including litterfall) and effects of management (e.g. harvest) on forests, grasslands and crops. The pool size and changes of soil carbon, and the associated fluxes (soil respiration) related to land use and land management. Ecological parameters and auxiliary information to interpret the results. Harmonized measurement protocols will be applied. A separate research activity is devoted to resolve also these methodological problems, and to assure quality control and cross calibration between sites of the flux network. 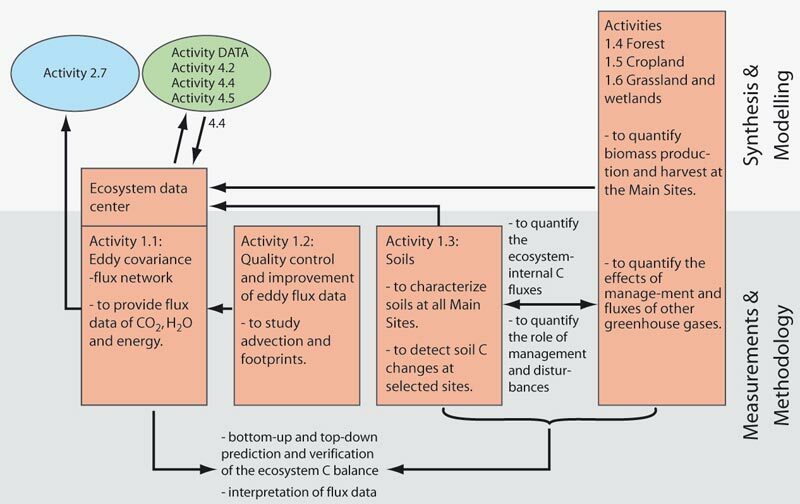 In the present IP the flux network consists of 51Main Sites (including 12 intensive verification sites with detailed measurements of soil carbon stocks and turnover) and up to 50 AssociatedSites. The distribution of study sites covers reasonably well the distribution of ecosystems by area and by estimated Net Biome Productivity (NBP, Janssens et al., 2003). The flux network is composed of 16 clusters, which should ideally cover the main land-use types of a landscape or region A cluster is an ensemble of sites of at least three different major ecosystem types, which consists of three or more intensively studied ”Main Sites” and less intensively studied ”Associated Sites”. The Main Sites will supply continuous data over 5 years, while the Associated Sites will deliver data for at least 1 year. In addition there will be roving eddy covariance systems in order to quantify the effects of land management in forests, grassland and crops. The Ecosystem Component will develop and apply a range of advanced ecosystem process based models, based on studies carried out during FP5 (e.g. the NUCOM model, Biome BGC, and others). These parameter rich, generally very realistic, models will be used to supply key parameters and to improve the larger scale models that will be applied at the scale of the continent in the Continental Integration Component. The organisation and the flow of data and information within the Ecosystem Component and with the other Components of CarboEurope-IP are shown in the figure below. Component 1 links mainly to Component 4 (Continental Integration). To simulate impacts of land management and climate change on the carbon (and CH4, N2O) balance and its main components in the main land use types of Europe. Figure: The organisation of the Ecosystem Component through different Activities and their objectives. The arrows indicate the relation to other Activities in the CarboEurope-IP .